Harmony, fun, relaxing great energy. We built this house in 2004, it's a great, relaxing place for summer, and winter retreats, you can enjoy ski resorts, great hiking, and the village of Ortisei has a great selection of shops and restaurants. Pinaid rest on the private land and is sun drenched in summer from dawn until dusk. Its the best, simple has that. Can be arranged directly with the manger for 15.00 euro per clean and dry. Garage tunnel underneath the barn is ideal for cars. We have private woodland, and excellent walking areas. Great for cyclist in this area. Stunning. The Dolomites is the very best, or one of the best in the world. They hold the Mens Downhill Race within 15 minutes to the downhill course from the house. Outside with ashtrays strict no dropping on floor. 100 Acres of private woods, and 560 sqm of outside play and lounge area. This property is quite unique, good mountain air, our own fresh filtered mountain water, and the local activities of the Dolomites. Have great contact for Ski hire etc (please ask). Skiers, Cyclist, Hikers, is a must for this vast area. Pinaid is a very special place to stay. It's a huge house but if there's only four of you it's homely enough to feel not too big, cosy even. Its position means it not only benefits from far-reaching, fantastic views but also keeps the sun into the evening, long after lower parts of the valley are in shade. 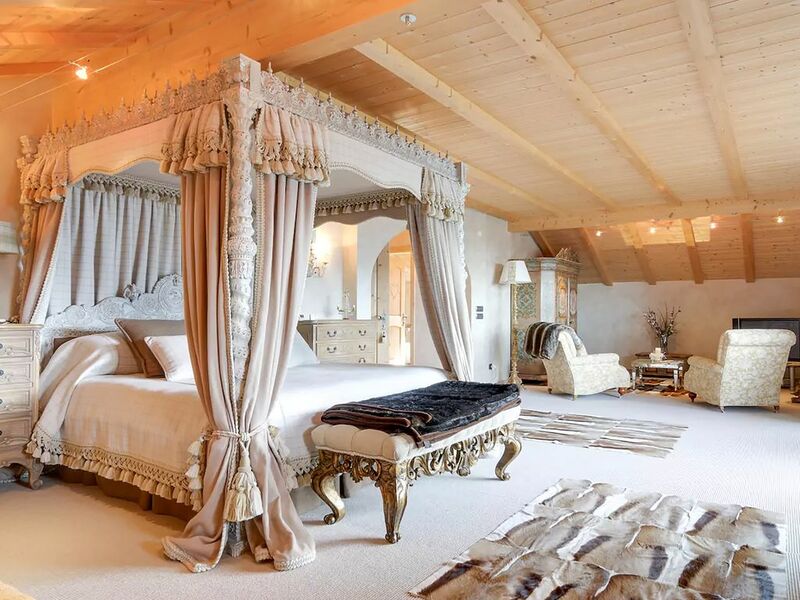 The beds are incredibly comfortable and the bedding supremely luxurious. The house is spotlessly clean and clearly treasured, with many homely touches and comforts. A member of our party spoke just enough German to converse with the housekeeper. There is a charge for her to do laundry, which is the only downside as the property has everything else you need for your stay. The nearest shop and restaurant are a drive away but we considered its out-of-the-way location to be a bonus. The location is great for visiting this area of the Dolomites, with many places reachable within a day trip. Thank you very very much for choosing Pinaid and for the wonderful review. We stayed for 4 nights (I wished we had stayed much longer) at this villa in the Dolomites. There is a reason the Dolomites are UNESCO world heritage site. They are incredibly awe-inspiring. And staying at this amazing villa really created the perfect trip for me and my family. Every room in the villa (bedrooms and living rooms) have either a balcony or a direct access to the gardens, with views of the mountains galore. The house has everything -- the kitchen is very well stocked, the living room is very warm and comfortable, and the bedrooms are all suites and very roomy, quiet, and cozy. The house is almost perfect with any parameter. The location is perfect, it was very clean and well equipped. Communication wis Annie easy and helpful. The only thing to improve is the internet signal..mainly for the kids. Villa Pinaid is one of the most comfortable houses we have ever stayed in - it really feels like a home but one you are lucky enough to live in rather than camping out in someone else’s & the perfect place for a large gang to gather. Beds are brilliantly comfortable, the kitchen is really well equipped & the whole house has a well thought out layout. We ski when we are here which is a bit of a drive each morning but just becomes part of the day. Amazing views and splendid isolation. We will be back! Our group from Australia loved this place. It is big enough to have 10 people. Well equipped kitchen. Large range of DVDs and books. Wonderful views. 15 mins drive to chairlifts taking you to the top of the world. We thought it was better than the photos. Very nice house with great views, roomy and comfortable. The house is situated near the end of a narrow road going up from the small village of St. Peter. There are three stories with several nice bedrooms and bathrooms and a large common room and kitchen. The place is very well equipped and the views are spectacular. WiFi is ok (a bit weak). Its a great base for trips in the area. What is missing: there are no large external play areas (court or garden, and not many internal play facilities (e.g., pool or table tennis). So there is not much to do for younger kids. On site help and advice you can get from Annie the housekeeper which is very nice and helpful, but speaks almost no english - if you are not fluent in either German or Italian, you need to take this into account. Overall a very pleasant stay. A beautiful summer or winter ski lodge for all the year round HomeAway Holiday Renters. Fresh Alpine Air and the Spectacle of the Dolomites Lajen/Laion, a sunny high-altitude terrace situated at 1400 meters above sea-level, between vineyards and Alpine meadows, is an idyllic vacation spot with magnificent vistas. The panorama of the Dolomites, the Langkofel / Sasso Lungo, the Sella Group, and the Schlern/Sciliar will take your breath away. The number of hiking trails and look-out spots is countless. And Lajen/Laion also has an artistic aspect insofar as it is believed that the famous Middle High German ballad-singer Walther von der Vogelweide was born in the hamlet of Ried/Novale, on the Vogelweid farmstead. Golf: The Challenges of the Dolomites Lajen/Laion and its subdivisions of St. Peter, Tschöfas/Ceves, Tanirz/Tanurza, Freins/Fraina, Ried/Novale, und Albions offer you complete relaxation and numerous excellent hiking trails. From here, you can quickly reach the Gröden Valley / Val Gardena and the Seiser Alm / Alpe di Siusi with their dolomite massives. Comfortable mid-altitude trails are also to be found in abundance, as well as 'Törggele' rustic inns and cable-supported climbing trails. Bicyclists and mountain bikers are likewise guaranteed vast opportunities to explore the landscape. The 'mountain cathedral,' as the parish church of Lajen/Laion is often called, tells a story of a special vacation region. Archeological evidence uncovered on the Innerraschötz / Resciesa Alpine Meadow indicates that Lajen/Laion was settled during the Stone Age, in approx. 6000 B.C. The first traces of human habitation at the Wasserbühl date back to the Bronze Age. After that, evidence of historical inhabitants can be found. The most-famous of these is without a doubt Walter von der Vogelweide; you are free to hike to and view the Vogelweid farmstead! You now have almost unlimited access to the attractions of this region: With the Gardena Card, you have complete freedom to explore this exciting vacation resort area. Ski: the nearest ski lift is around a 9 kilometer car ride to the village of Ortisei. This lift connects to the famous Sella Ronda which has 140 kilometers of connected ski runs.Alp de suisse also another beautiful resort connected to this village.The famous mens downhill runs from the next village Santa Christina, and further up the mountain you arrive in Selva the heart of Val Gardena.These ski resorts are all connected and will take you as far as San Cassiano.